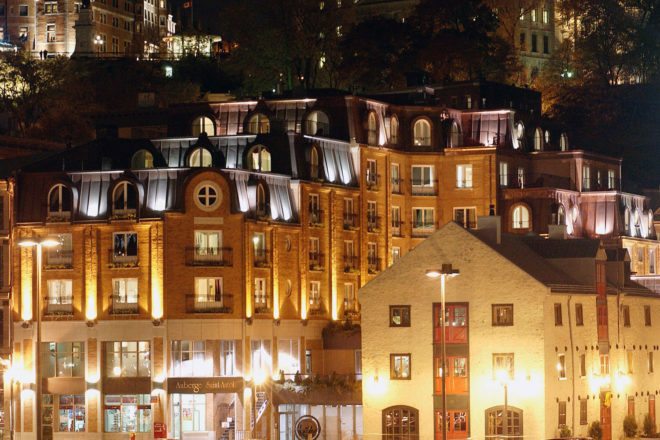 Auberge Saint-Antoine hotel in Quebec, Canada. Some of the ancient artefacts found during the restoration of the Auberge Saint-Antoine, Quebec. Construciton was stopped for nine months whilst the archaeological works were completed. Quebec City is a treasure trove of fabulous hotels. Each one is slightly different but there is only one that is universally acclaimed as unrivalled, the Auberge Saint-Antoine. Reviewed by Quentin Long. Spoiler alert, you are about to be assaulted by superlatives. Thesaurus at the ready, look up superb. It is an essential value of International Traveller to use superlatives very sparingly and only when truly deserved. But this humble boutique property in Canada’s historical city earns it. From the outset, the Auberge has been a story of care, dedication and flair. When Quebecois family the Prices began excavations to construct the hotel from three different 18th and 19th-century buildings in 1988 on the St Lawrence River in the heart of the city’s gorgeous historic Petit Champlain region, they unearthed one of the largest and most important archaelogical treasure troves in the city’s rich history. More than 5000 objects were unearthed ranging from fine china tea cups circa 1725, clay British pipes circa 1795, and an 18th-century canon muzzle. Without hesitation they redrew their construction plans for the hotel to be in sync with the archaeological dig, despite significantly blowing out the timeline. The first section of the hotel, just 23 rooms, opened in 1992 and the last rooms were completed at the end of 2003 before its Panache restaurant opened its doors in 2004. Today the finds of the dig are displayed throughout the hotel, mostly in small, beautifully curated and constructed, cubed display cabinets. The display lighting changes colour from muted pastel pink to purple and blue. It’s like staying in a modern art gallery. Every guest room is named after one of the artefacts. Fragments of the eponymous artefact are then displayed next to the room number and in the desk in room. On my first stay I bedded down in Les Chambres Nostalgiques named after the style of 18th-century English porcelain found in the dig and of course now in the room. The archaeological collection is just one aspect of the carefully thought out hotel experience which cleverly ranges from reserved to fun without ever feeling disjointed or confused. It is all so cleverly, thoughtfully pieced together to create the holy grail of hotel milieu; being a guest is a personal affirmation, only those with discerning tastes and ability would ever stay here. The styling of the entire hotel is soft, comfortable, chic without on iota of pretence. No clean minimalist lines but much more organic, warm, comfy and curvy. The whimsical chandeliers in the lobby with tiny little birds sitting on branches hint at the sense of fun. It is just these touches and sophistication that make it such a beautiful place to stay. Like all great hotels, the staff make the experience. Not stiff or formal, there is a real sense of pride and confidence in their work and place. When the front office greeted me with a “Welcome to Auberge St Antoine” I actually believed they were proud to have you stay at their auberge. Bags are whisked up with you to the room and the porter proudly walks you through how to use the room amenities like light switches (a bug bear of mine – which light switch does what?) and how to turn down the freezing air con. Sitting in the soft enveloping private booth of the lobby café and bar, appropriately-called Artefact, the menu is a perfect balance of interesting and appealing meals. My chicken salad with Granny Smith apples and mustard vinaigrette was delicious. The Panache restaurant is said to be one of the finest in the city, however I was on a Sydney deadline and had to settle for in-room dining. Fabulous salad and steak, the meal was far above the standard room service. The only small flaw I found at the Auberge (in the interests of balance I did try and find them) is the views over the river sound better than they actually are. For some unknown reason, the Quebecois have chosen the very riverfront for a massive car park, right in the heart of town. It is crazy. At checkout the Auberge continues to surprise and delight with a light and personal touch. With your departing receipt you are also handed a small cellophane parcel of homemade jellies and cookies for your journey. It’s the kind of thing your mum would do, send you off for the day with a special treat and the gesture subconsciously touches you in the same way. That’s just the class and smarts of the place. We stayed twice and paid $346 (including taxes) for bed and breakfast. The castle hotel that towers over the city, the gorgeous structure is not boutique at 600 plus rooms, but has a great bar and aspect over the city, if not as personable service. It’s currently undergoing a huge refurbishment. 1 rue des Carrières, +1 418 692 3861. Another great boutique hotel in the Petit Champlain region with a more corporate feel and no restaurant. 126 rue Saint-Pierre, Québec City, +1 418-692-2224. A funky chic and great value boutique hotel in the historic Petit Champlain region, the hotel is relatively simple but stylish, The café downstairs is a great start to the day. 71 rue Saint-Pierre, Québec City, +1 418 692 1171.